Not to be confused with Huron Township in Huron County, Michigan. Huron Charter Township is a charter township of Wayne County in the U.S. state of Michigan. The population was 15,879 at the 2010 census. Huron received its name from the Huron River, which flows through the township from the northwest corner to the southeast corner. Huron Township is home to three Metroparks situated along the river. 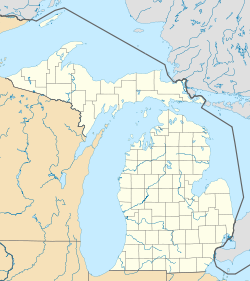 Huron Township was organized in 1827 and originally included the land that now contains the cities of Romulus and Belleville as well as the townships of Van Buren and Sumpter. In the 1830s, a settlement was platted on the banks of the Huron River. The first post office opened with the name Huron, but soon closed. In 1860 a new post office was opened with the name Catville but changed its name to New Boston by 1868. Other early settlements included Belden, platted in 1857 by Frances J. Belden and now known as Willow, and Waltz, platted in 1872 by Joseph Waltz. On March 17, 1835 the northeastern portion of Huron Township was set off and organized as Romulus Township. Within a few weeks, on April 6, 1835, the northwestern portion of the township became Van Buren Township. On April 6, 1840 the western half of the remaining portion of Huron Township organized as the township of Sumpter, creating the current boundaries of township. According to the United States Census Bureau, the township has a total area of 36.0 square miles (93 km2), of which 35.6 square miles (92 km2) is land and 0.5 square miles (1.3 km2), or 1.28%, is water. As of the census of 2000, there were 13,737 people, 4,745 households, and 3,796 families residing in the township. The population density was 386.2 per square mile (149.1/km²). There were 4,888 housing units at an average density of 137.4 per square mile (53.1/km²). The racial makeup of the township was 95.96% White, 1.08% African American, 0.64% Native American, 0.36% Asian, 0.01% Pacific Islander, 0.52% from other races, and 1.43% from two or more races. Hispanic or Latino of any race were 2.50% of the population. There were 4,745 households out of which 39.9% had children under the age of 18 living with them, 65.3% were married couples living together, 10.1% had a female householder with no husband present, and 20.0% were non-families. 15.8% of all households were made up of individuals and 5.0% had someone living alone who was 65 years of age or older. The average household size was 2.88 and the average family size was 3.19. In the township the population was spread out with 28.4% under the age of 18, 7.7% from 18 to 24, 31.7% from 25 to 44, 24.4% from 45 to 64, and 7.7% who were 65 years of age or older. The median age was 35 years. For every 100 females, there were 100.9 males. For every 100 females age 18 and over, there were 98.8 males. The median income for a household in the township was $59,890, and the median income for a family was $63,003. Males had a median income of $49,356 versus $31,140 for females. The per capita income for the township was $23,497. About 3.4% of families and 5.7% of the population were below the poverty line, including 5.9% of those under age 18 and 4.9% of those age 65 or over. ^ "Race, Hispanic or Latino, Age, and Housing Occupancy: 2010 Census Redistricting Data (Public Law 94-171) Summary File (QT-PL), Huron charter township, Wayne County, Michigan". U.S. Census Bureau, American FactFinder 2. Retrieved September 8, 2011. This page was last edited on 19 January 2019, at 04:00 (UTC).